1911 census he is in Mullaferry Co Mayo, near Killala. aged 16. Born County Londonderry, son of a Presbyterian Minister. 1912 He signed the Ulster Covenant in Portrush County Antrim, giving his address as the Manse, Killala, County Mayo. 1915 Apr 30. The undermentioned temp. 2nd Lts. (attd.) (unless otherwise stated) are transferred to Ser. Bns., with seniority shown against their names: —R. Innis. Fus.—R. M. Boyle (from, a Res. Bn.). 1917 Aug 26. R. Innis. Fus. The undermentioned to be temp. Capts. :— Temp. Lt. R. M. Boyle. 1918 Mar 9. R Inniskilling Fus. The undermentioned temp. Capts., from Serv. Bns., to be temp. Capts. with seniority specified against their names: — R, M. Boyle, M.C. 26 Aug. 1917. 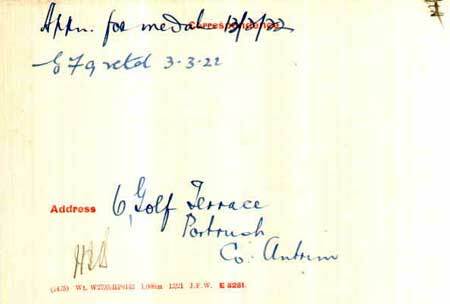 1918 Jul 8 MC gazetted T./Lt. Robert Matthew Boyle, R. Innis. Fus. For conspicuous gallantry and devotion to duty. He led two machine-gun sections with great skill in an attack, and contributed materially to the success of the advance by putting several hostile machine guns and snipers out of action. He displayed magnificent courage and leadership. 1921 Feb 4, Joined ADRIC with Aux. no. 1635. 1951 Jan 1. MBE gazetted. 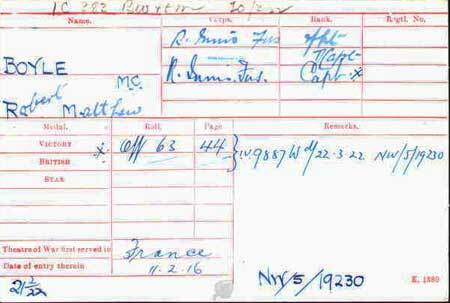 Captain Robert Matthew Boyle, M.C., Assistant Staff Officer to Inspector General, Ulster Special Constabulary. Hinton Park, Londonderry. 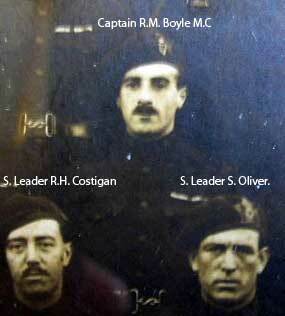 10th Skins Old Comrades list into the 1950's.